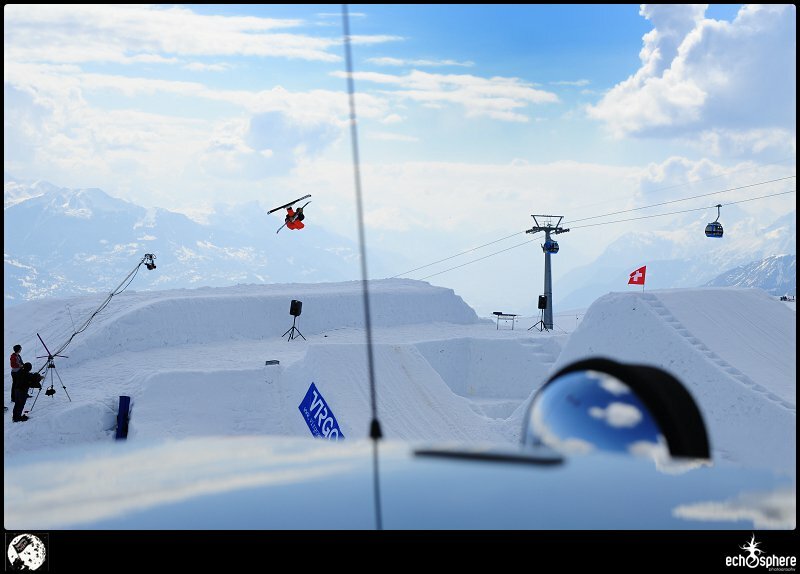 A complete new big air module (for Switzerland at least), shaped especially by HO5 Park (http://www.ho5park.com) build on the ruins of the Champs Open which took place in February. Arriving on the mountain after a nice and restful night, we hooked up directly to the contest zone, which was not in the snowpark area, and the kicker seemed really FAT. 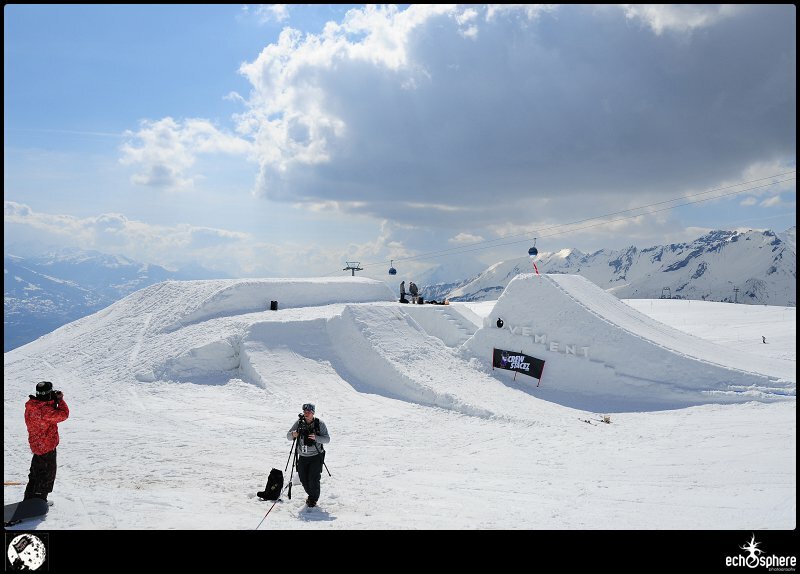 Many riders were impressed in the way that French part of Switzerland could produce such a nice kicker, especially when we see how nice the Germans build theirs in Laax or for the Ambuhl Invitational. Training began with sunny weather and hard snow. Just perfect! 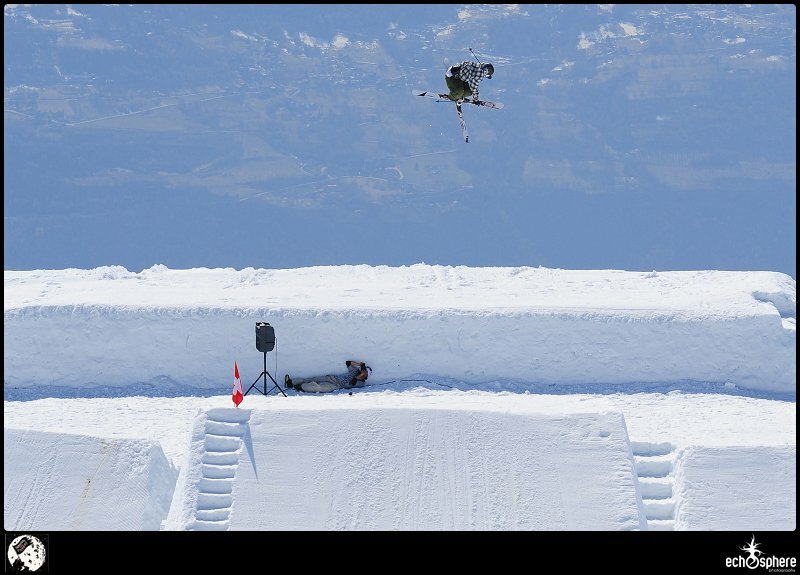 Even the snowboarders who were frightened by the biggest kicker took a shot at it. Since the speed was fine, and the airtime evaluated at three seconds, many tricks could be pulled out! The training has begun, with Ivan Metrailler. During that time, Greg Tuscher flies with the paraglider. Around 11pm, the organizers announced the beginning of the competition. For the first run, every rider (skiers and snowboarders) had two runs to prove that they have the capacity to move towards the next selection run. The natural selection eliminated four riders in the first one, mostly unknown riders who were just happy to ride the module. 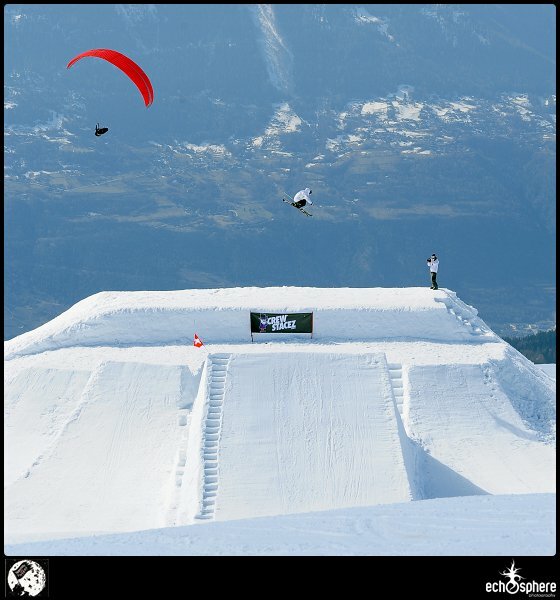 The contest and the real selection started on the second run when Yvan Metrailler and Tom Barnier with a cork 720 truck driver were dropped. 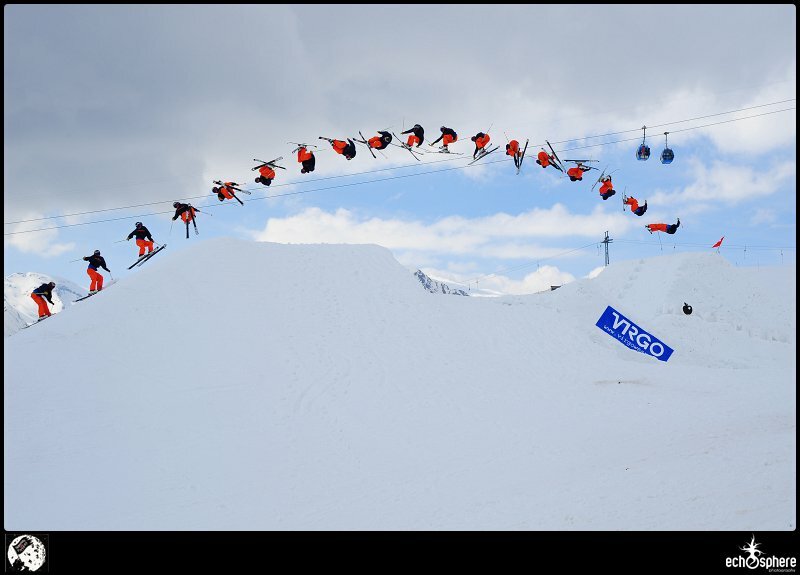 On the third run, JL Ratchel and Greg Tuscher were eliminated; quite a shame for JL since he pulled off a really massive and impressive zero spin, but the landing must have killed him since he was a little bit too short. On his side, Greg pulled out a nice Lincoln mute, but just not enough tweak to pass towards the next selection run. Merciless, but it&rsquo;s the rule of the game. 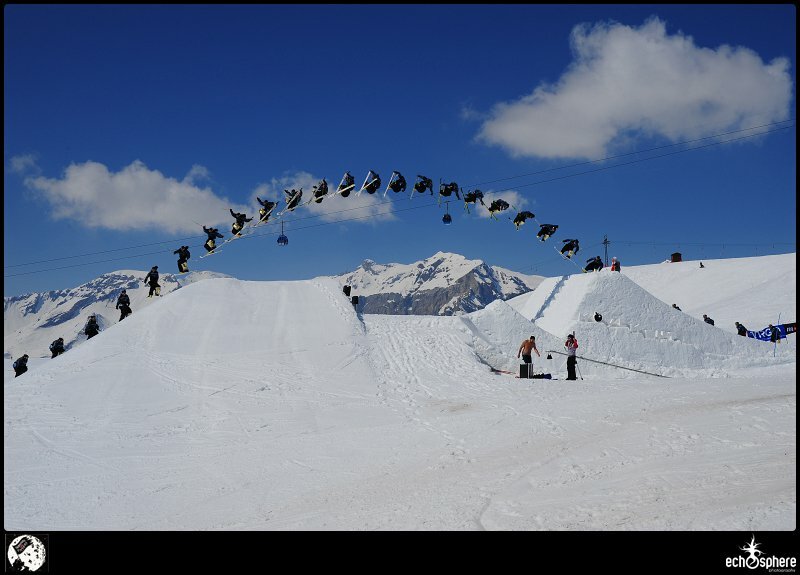 Laurent De Martin, the young Swiss rider who is coming up these days was eliminated on the next run, same as Janne Von Enckevort, for whom the doubles were just not enough (double backflip landed quite badly and a frontflip to superman). The stratospheric zero spin of JL Ratchel. Five riders were still on course for the finals and the title of Ultimate Survivor; Paddy Graham, Alex Neurohr, the Ambuhl brothers Elias and Andri (who had the cleanest style of the weekend) the Norwegian Halvard Olavsson Thon, who by the way made the trip to Switzerland only in the aim of riding the module. Pretty nice attitude from the guy. ...and Halvard Olavsson Thon with his tails on the other! So guess who was executed before the finals? Well Paddy Graham, the English rider was one of them. He was mostly spinning normal tricks like 5&rsquo;s, 7&rsquo;s, and at some point he took out a flatspin 5 japan shifty very clean and nice. But it was not enough for the finals. The other rider to drop just before the finals was Alex Neurohr who was pulling out some amazing spin tricks with double shiftys. ...and finished with a flatspin 5. Well now you know who passed through the finals: the two Ambuhl brothers, and Olavsson. The finals were just about the theme, natural selection. These three riders have been spinning so much during their two runs of finals that it couldn&rsquo;t be harder for the judges to select who was the strongest, aka the fittest. Switch unnatural 1080 mute from Andri Ambuhl, switch 1080 tail grab from Olavsson, and a massive double cork 10 from Elias, but just didn&rsquo;t land it perfectly. No one could know at this time who would win, and the tension was really high for the ultimate run of the day. Andri went first and hit the kicker with a switch 10 bow and arrow grab. Amazing. Coming next the Norwegian Olavsson pulled a perfect switch 12 over grabbed tail out of nowhere. All the spectators were screaming like we had found our winner of the day, but there was still a rider to go and not the least, Elias Ambuhl. He reattempted his switch double cork 10 mute and landed it perfectly this time. 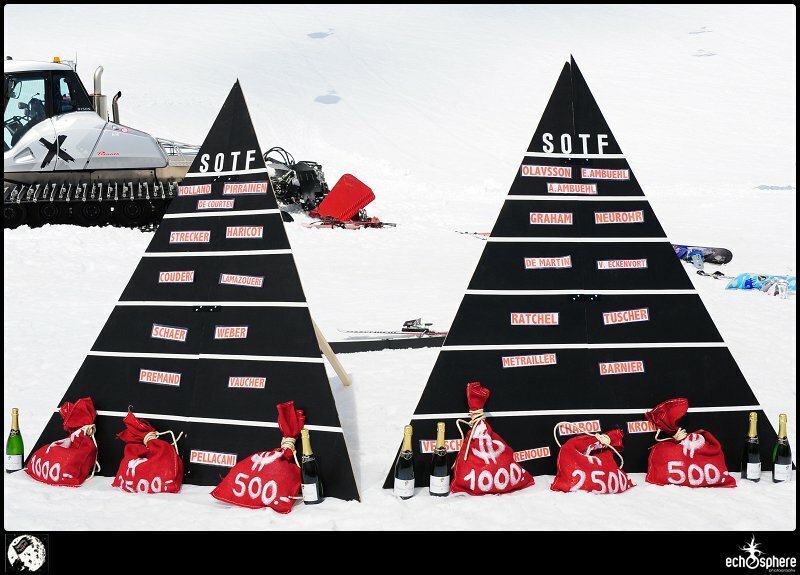 He won the Crown of the ultimate survivors, the strongest and the fittest skier of the day. 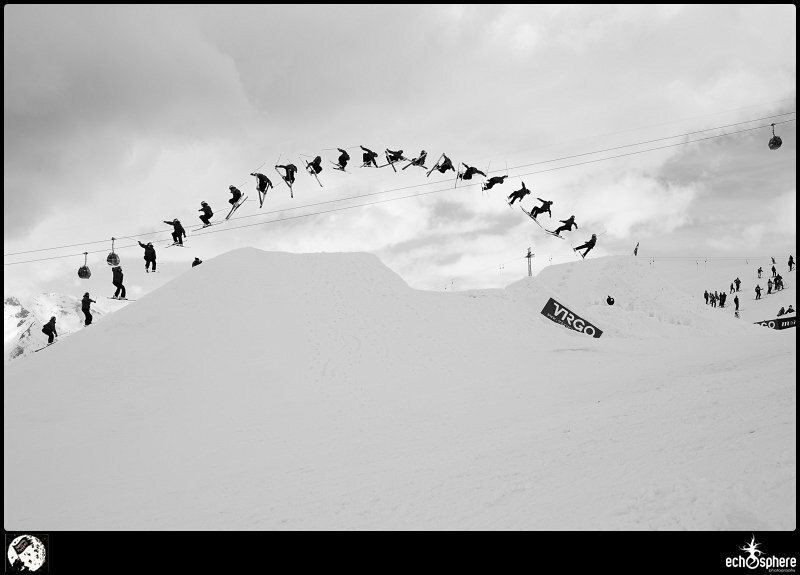 Halvard and his switch 10 tail grab. 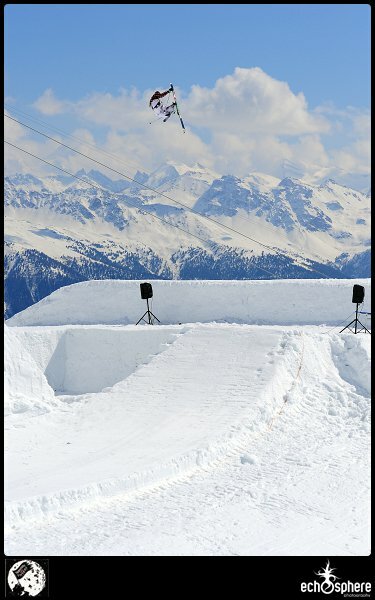 Elias Ambuhl and his winning trick, a switch double cork 10 mute. On the snowboard side of things, the riders were doing pretty fine as well, coming out with some nice tricks including double rodeo 9 from Dan Premand, and many backside 9&rsquo;s from Mathieu Schaer. 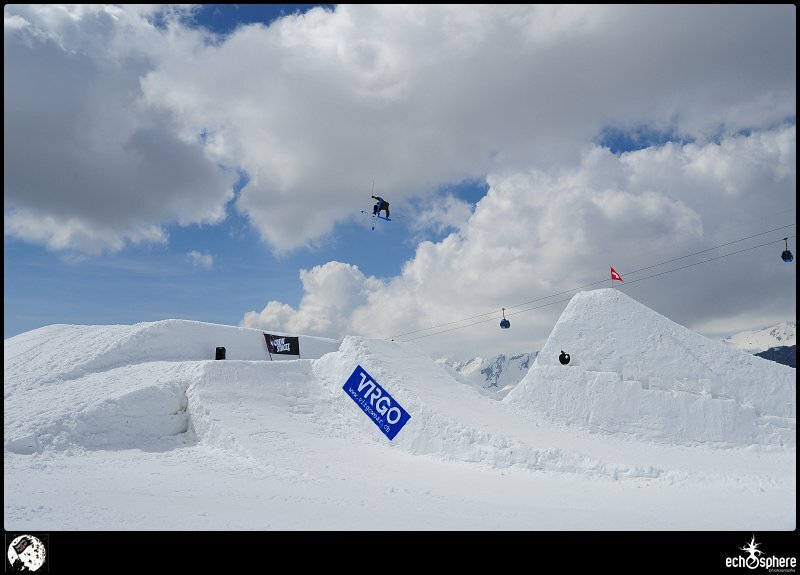 Severin De Courten (CH), Anti Pirrainen (FIN), and Anton Holland (CH) moved onto the finals, which was won by Tonton Holland with a backside 1260. The board of the competition, with on snowboarding on the left, and skiing on the right. After a very agitated night due to the Saturday night party, most of the riders woke up with a hard headache (due to the welcome cocktail at the party?) and only three-four hours of sleep. However after an aspirin or two most of them were on the module near 12am on Sunday for the free session. 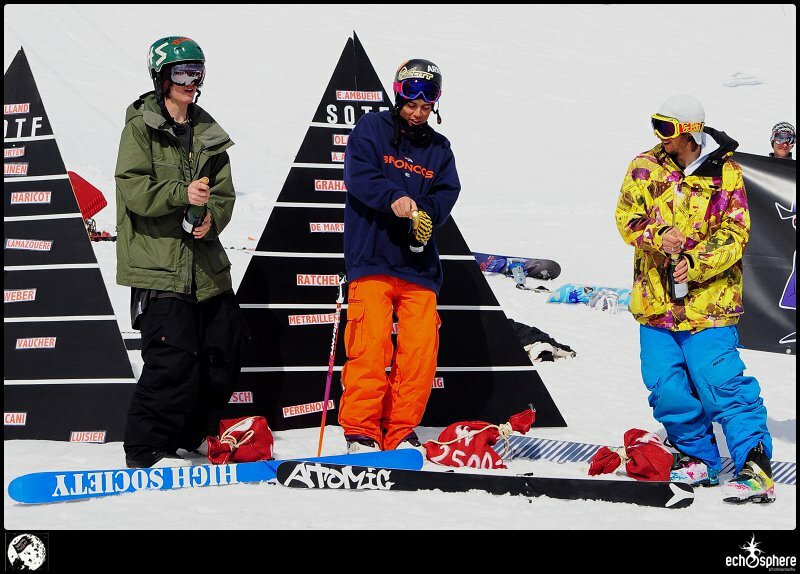 Some of them were already there at 11am in order to ride the kicker in the best conditions as possible. The crowd responded as well to this Sunday session. No competition atmosphere, just riding, and for fun. 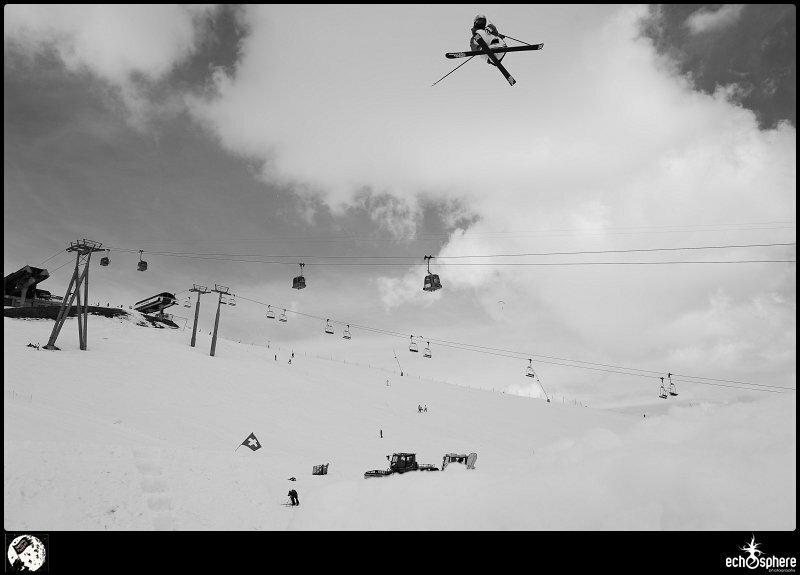 This session was the opportunity for many skiers from Switzerland to come and ride the one time kicker, and for others to come with their own filmers and photographers, which made in a way more people on top of their game. And weather-wise, you couldn&rsquo;t ask for much more from the organizer&rsquo;s standpoint. The sun was shining, no clouds were visible, no wind was present, so the conditions were just perfect for the session&hellip;and the barbecue party could go on. 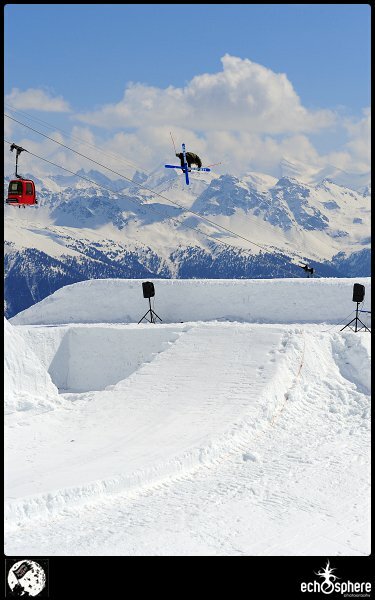 The event director, Florent Beauverd, took the time to ride his kicker on Sunday. 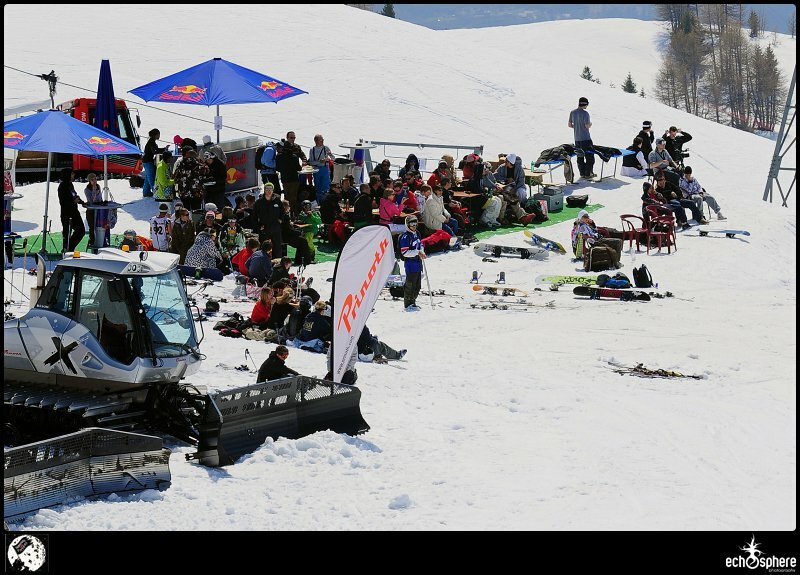 Since the organizers couldn&rsquo;t take part of the contest, this day gave them the opportunity to ride their kicker in front of everybody. And they took full advantage and did some great stuff, especially Florent Beauverd and Carim Bouzenada, who rode to module at the same time (on the small kicker) and both pulled out both a superman. The Vuignier brothers, Nicolas, a young promising rider as well and his brother Anthony (who came back especially from Whistler) took the opportunity to ride it as a family set. A few guys came especially from Geneva for the day, and just killed the session with some sweet tricks. But the most motivated rider was still the Norwegian Olavsson, for whom the kicker was just perfect. It was impossible to ask him to stop. 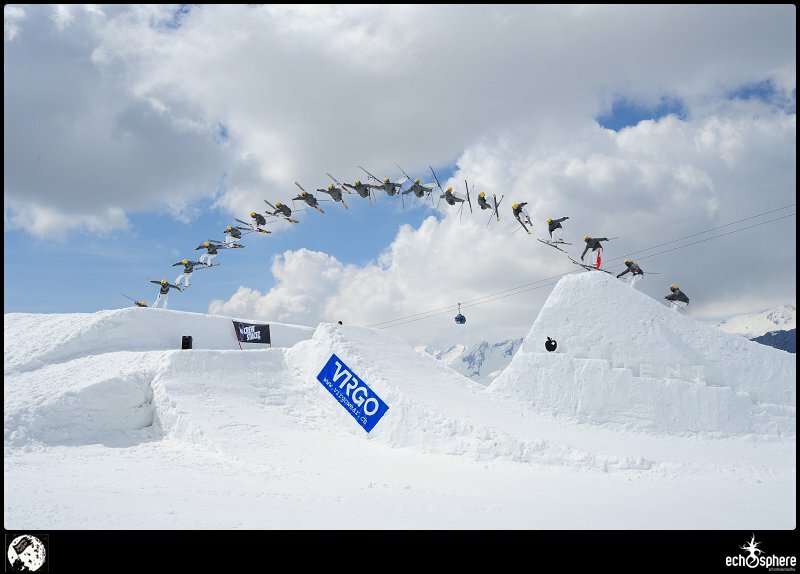 He took every run to perform new tricks or perfect some grabs he had in mind. Big brother of Nicolas, Anthony made the trip especially from Whistler where his spent his winter. 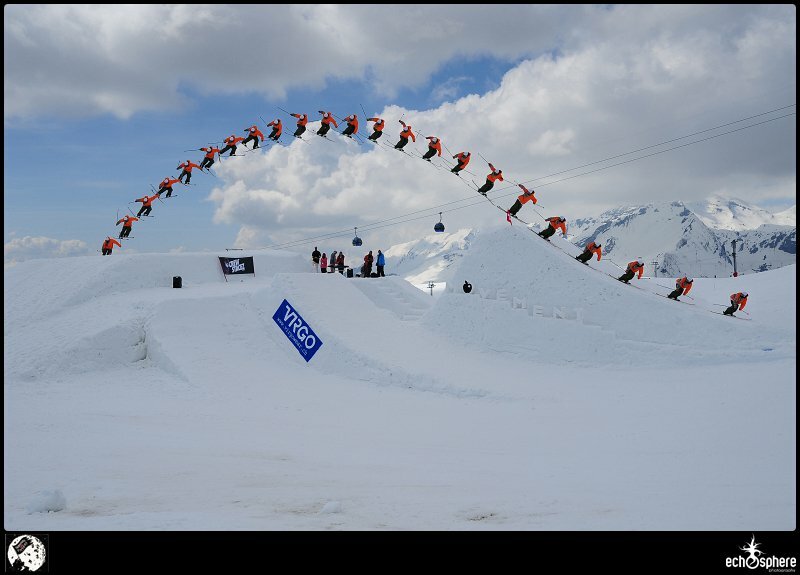 Elias Ambuhl was still motivated on day two, and prefered a classic flatspin to his double cork. 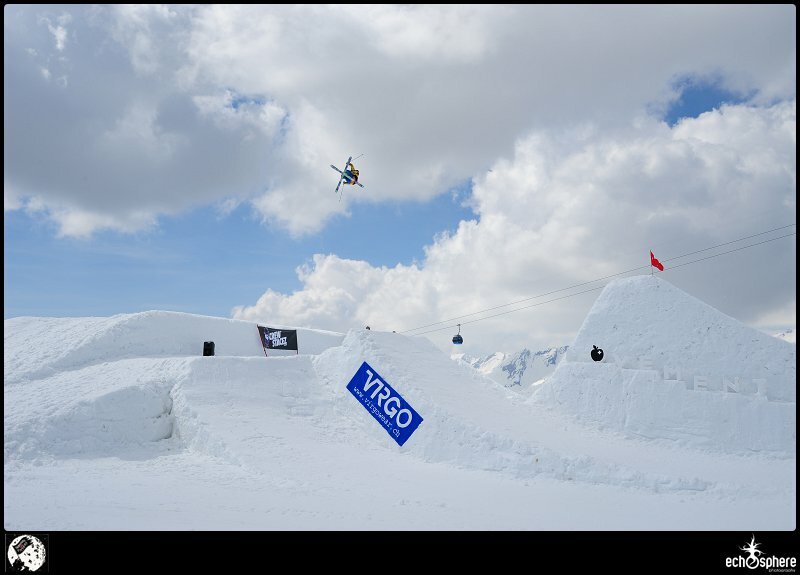 Halvard took every opportunity to ride the kickers and perform his favorite tricks. Martin Robin, one of the guys who came from Geneva, and who rides 9XL pants. 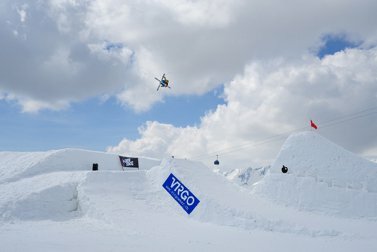 Well, we&rsquo;re all resolved to say that this first edition of the SOTF was successful in many ways, good level of skiers, and snowboarders, nice atmosphere, great organization everything that you could hope. Will there be a second edition next year? &ldquo;Certainly&rdquo;, responded the event director Florent Beauverd. So see you next year and big up to the Crewstacez for everything! Thanks guys. For more information about the competition check out http://www.crewstacez.com, and to check out interviews with the winners click here.